We are only as strong as our weakest link, for me that is my hands. Often out on the hill I suffer from terribly cold hands. 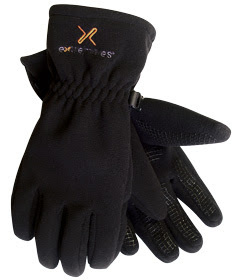 The only solution seems to be windstopper gloves, which I tend to use in all but the sternest of winter conditions, my last pair have simple fallen apart, so shopping for a new pair is quite hard, as I have reasonable wide hands but short fingers. These gloves fit me well and the sticky grip seems like when I have a ice axe in hand will offer all the grip that I need. The fit also means that I will be able to do all but the hardest scrambles in them, this will be a true test of their build as scrambling has a tendency to tear gloves to shreds. However these seem reasonably well put together, and should last well under the barrage of abuse that I put them through.